The Master Omraam Mikhaël Aïvanhov was born on 31 January 1900 into a poor family in the mountain village of Serbtzi in Macedonia. His father travelled across Bulgaria to Varna on the Black Sea to make a living, and Mikhaël and his siblings were brought up by their mother and the extended family, which included his grandmother (a midwife and healer), to whom he was especially close. What Mikhaël called his ‘childhood passions’ were significant: fire, coloured threads, water gushing from a spring, birds and climbing tall trees. All these later came to represent spiritual truths for him. e poverty, and Mikhaël was obliged to work from an early age, first for a blacksmith and then in many other trades. enced his first spiritual awakening, during which he heard the music of the spheres. In 1917 he met the Master Peter Deunov in Varna and became his disciple. Mikhaël loved music and his violin was one given him by his master. After his university studies in Sofia, Mikhaël became a college teacher and, in 1934, a college director. At the same time he steadfastly followed the teaching of Peter Deunov, which was a field of profound exploration and experiences. In 1937, faced with the rising threat of communism, Peter Deunov sent Mikhaël to France to spread his spiritual teaching. Mikhaël quickly learned French and began giving lectures at Sèvres, near Paris. In common with other spiritual initiates, he underwent periods of profound suffering but through the power of his spirit he was able to transform these experiences into what he called ‘precious stones’. 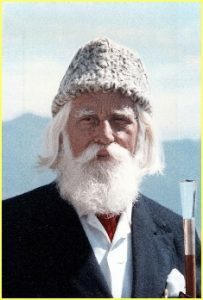 Over the course of almost 50 years, he gave thousands of free public lectures and private interviews, initially in Paris and later at the main centre of the Fraternité Blanche Universelle (known in English as the Universal White Brotherhood) at the Bonfin near Fréjus in the south of France. In 1959, Brother Mikhaël, as he was still known, made his first trip to India where he met Neem Karoli Babaji. He was given the spiritual name Omraam after undergoing a profound spiritual and physical transformation. On his return to France his disciples noted the striking resemblance to Peter Deunov and were spontaneously moved to call him ‘Master’. As well as continuing to teach at the Bonfin, he also travelled all over the world giving talks and visiting spiritual sites. As a man and a teacher, he was seen to be a true master of himself, manifesting the presence of the divine world, and his talks were full of wisdom, love, vitality, humour and integrity. By the time of his death in 1986, Omraam Mikhaël Aivanhov’s teaching had a following of thousands throughout the world. It has since spread to every continent, and his lectures have been translated into 32 languages. Many followers visit the Bonfin each year to do collective spiritual work, and there are several centres and groups worldwide who practise the spiritual methods he taught.